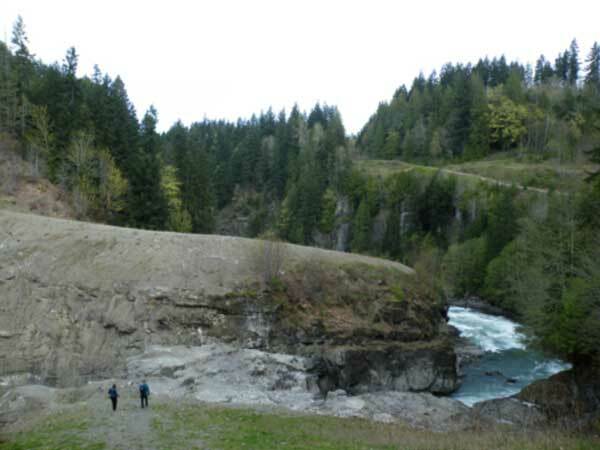 The site of the Elwha Dam following its removal. The embankment in the middle distance is all that remains of the original structure. Photo: Alexander Portch. I first became aware of the Elwha and its rich and complex history through the discovery of Mapes’ book while researching possible comparative studies to consider alongside the saga of the Severn Barrage. Although the dams may not have made use of the tides as their source of energy, I found the subject fascinating as an example of what can happen to a river when a dam is built and, more interesting still, what the implications are of its subsequent removal many years later. The question arose: if a Severn Barrage were to have been built, would there have ever come a time when a case would be made for its removal and, if successful, what would the outcome be of the river’s “rebirth? To then have the opportunity to visit the Elwha and the site of one of its former dams (there were originally two – the Glines Canyon Dam in its upper reaches, and the Elwha Dam closer to its mouth) as part of the 2016 American Society for Environmental Historians (ASEH) conference in Seattle was an unexpected, but very welcome, pleasure. The conference – at which I presented a poster on my research – was an enjoyable, productive and intellectually stimulating event, with panels ranging from the application of GIS to the study of industrial London and its overseas trade in the 18th and 19th centuries, to “twentieth-century energy frontiers” and the challenges of doing premodern environmental history. However, the visit to the Olympic Peninsula, the Elwha, and particularly the point at which the river meets the Strait of Juan de Fuca within the bounds of the Lower Elwha Klallam Tribe’s reservation, was especially memorable. The view of the Seattle skyline from the ferry crossing Puget Sound on the return journey from the Olympic National Park. 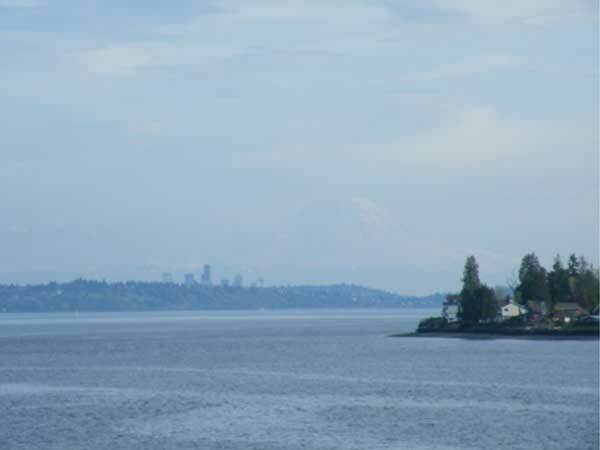 Just visible in the far distance is Mount Rainier, an active volcano. Photo: Alexander Portch. Since the removal of the dams a vast quantity of sediment, previously trapped many miles up-river, has been allowed to flow unobstructed to the sea, being deposited at its mouth. 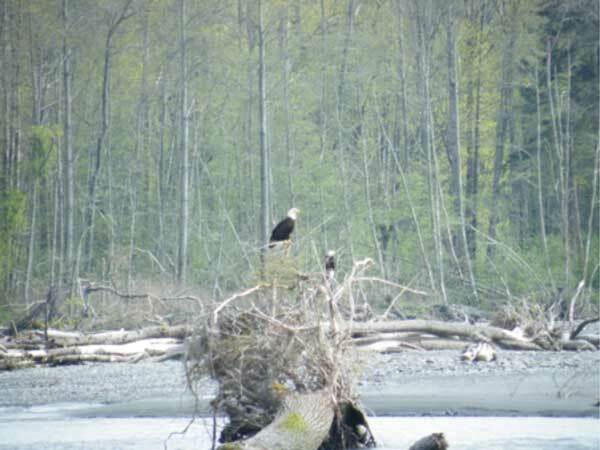 Local tribal members can now walk hundreds of metres out along this accumulated material; with Bald-Headed Eagles gliding majestically overhead, drawn by the return of salmon and other marine species. For me this sight was particularly striking as the Severn is also a river characterised by high volumes of sediment which, it has been suggested, would be trapped behind a barrage, potential blocking and damaging the turbines and requiring regular dredging to keep in check. I wonder what would happen following the removal of a barrage, and the release of all that aggregate? 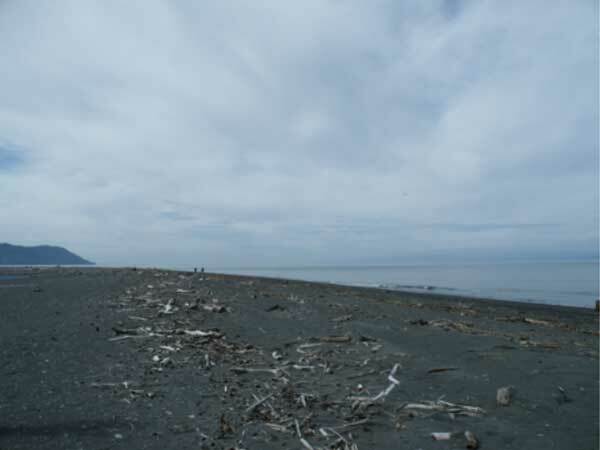 The newly formed beach at the mouth of the Elwha River within the bounds of the Lower Elwha Klallam tribal reservation. Most of this material has been deposited within the past couple of years. Photo: Alexander Portch. Equally interesting were the insights provided during a stop at the Elwha Dam removal site by one of the archaeologists from the National Park Service who was closely involved in the restoration project. As part of that process archaeological surveys were required, including excavations of prehistoric sites encountered in the vicinity of the dams themselves, and features that were revealed as the lake waters fell and the river resumed a more natural course. Alongside the remnants of early human activity, the dams too were recognised for their historical and archaeological significance. Having been constructed at such an early point in the development of hydroelectricity, and still retaining much of their original machinery, they had been placed on the National Register of Historic Places, necessitating detailed historic building surveys prior to their removal. A Severn Barrage has frequently been cited as having an expected lifespan of up to 120 years. After that period had elapsed would it too be considered as an important part of the nation’s heritage; something requiring thorough recording and analysis before finally being retired from service? Or, conversely, would it be preserved as a monument and museum to 21st century innovation and ingenuity? One thing is for sure, at 18 kilometres (11 miles) in length it would keep archaeologists and historic building surveyors busy for a very long time! N.B. Attendance at the ASEH conference was made possible by a travel grant from the University of Bristol’s Alumni Foundation. Bald-headed eagles wait patiently at the mouth of the Elwha, perhaps for salmon returning to their spawning grounds in the now-accessible upper reaches. Photo: Alexander Portch.